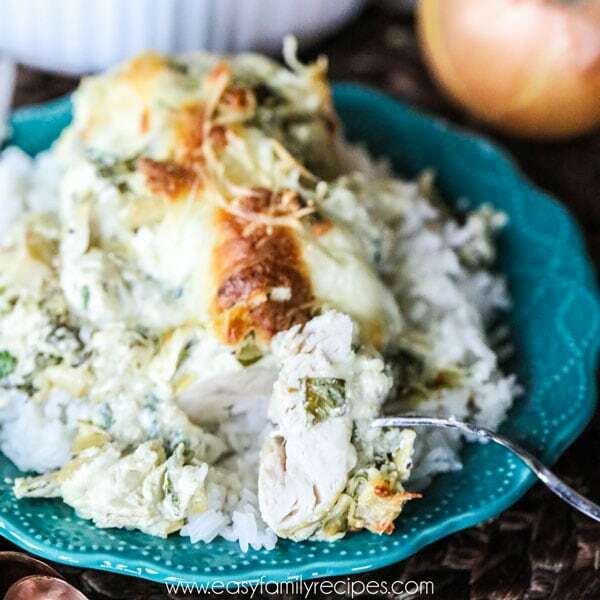 If you love spinach artichoke dip, then this Spinach and Artichoke Chicken recipe might just be your new favorite dinner. Baked in one dish, it is simple to make with fresh ingredients and easy to clean up so you can have a delicious hot meal on even the busiest of nights. 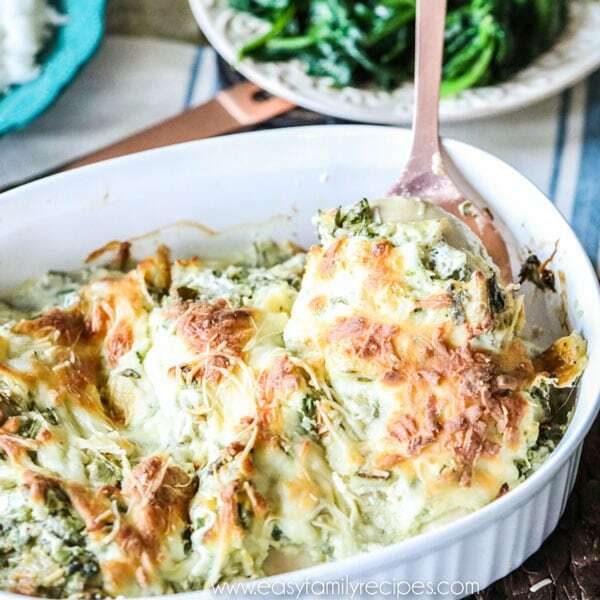 I don’t know what it is about combining spinach and artichokes with some creamy goodness but I think a little bit of magic happens, because despite starting as super healthy veggies, once they are baked these foods are pretty much transformed into the ultimate comfort food. One dish chicken meals are kind of my jam. I have created quite a lot of chicken recipes over the years, some of which have reached millions of people like this super popular Baked Chicken Fajitas recipe. Crazy, right? I have had this particular recipe on my mind for quite awhile. 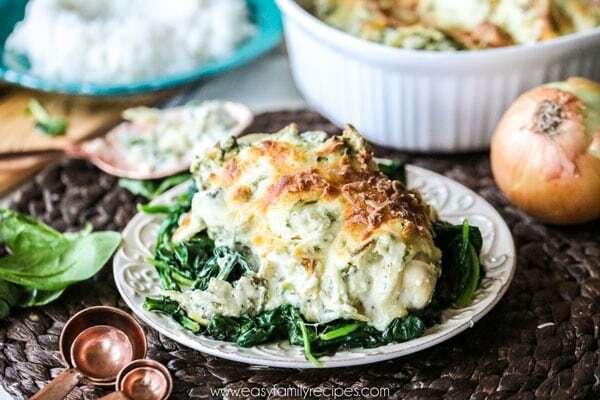 I feel like any excuse to eat spinach artichoke dip is a good one, and since there is not one, but three veggies in this recipe, it was just meant to be piled on top of tender, juicy chicken breast to make a whole meal. 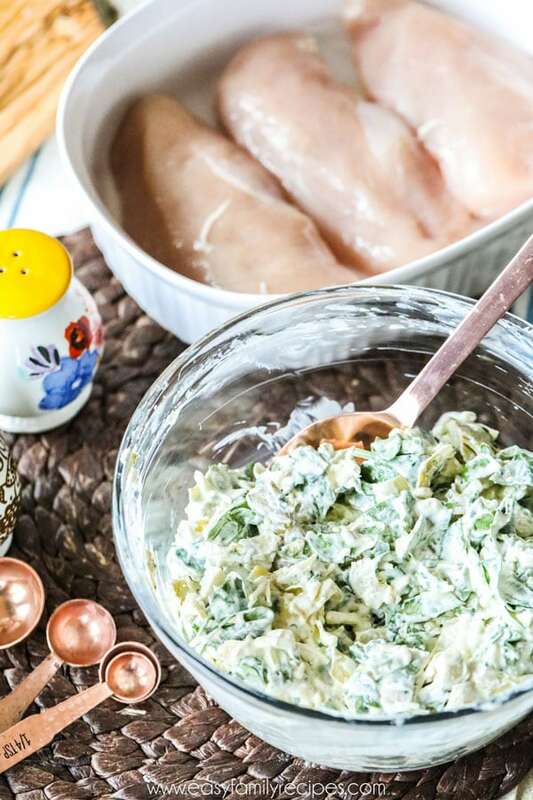 Just so we are on the same page… I am taking creamy, dreamy spinach artichoke dip and smothering chicken in it. And it’s marvelous! If you need more marvelous recipe inspiration… sign up for my Hungry E-mail Club! I send a weekly email with all of the easiest and tastiest recipes! SIGN UP HERE! How do you make spinach dip? While you could go to the store and buy a tub of dip, but I am going to beg you not to, because it is just not going to be the same. Using fresh ingredients makes a huge difference in the taste and texture of the dip. There a a few different ways to make spinach dip. Some dips are cream cheese based, but I have always made mine with a mayonnaise base. Although both are pretty darn good, the one we use here is mayonnaise based. Not only does it make an amazing dip, but it also helps to tenderize the chicken while cooking. 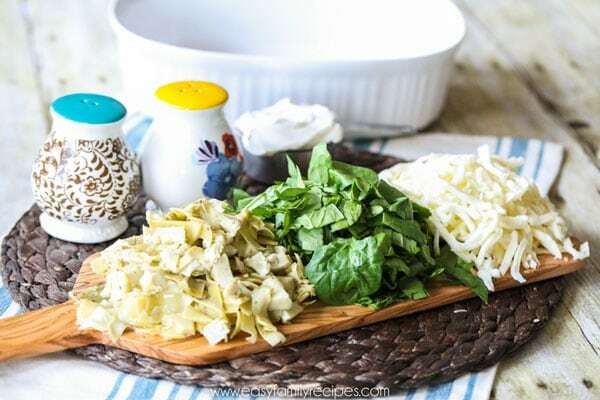 The mayo is combined with fresh spinach, canned artichokes, onions, mustard and lots of cheese and baked to create that flavor that is just pure bliss. 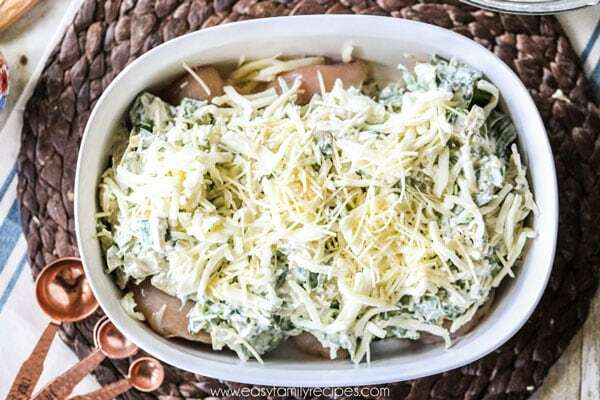 Follow the recipe below to make my spinach dip topping, or substitute your tried and true recipe for dip in the Spinach and Artichoke Chicken. Rice– Serving this on a bed of rice is easy and really tasty. The rice soaks up the extra juices from the dish and creates a really nice complete meal. You can use white rice, brown rice, long grain, or any type you like! Potatoes– Serve this on top of a bed of mashed potatoes, or a side of roasted potatoes. Bread– Everything is better with a nice crusty piece of garlic bread and this is no exception! Use it to soak up all that creamy dip along with your meal. 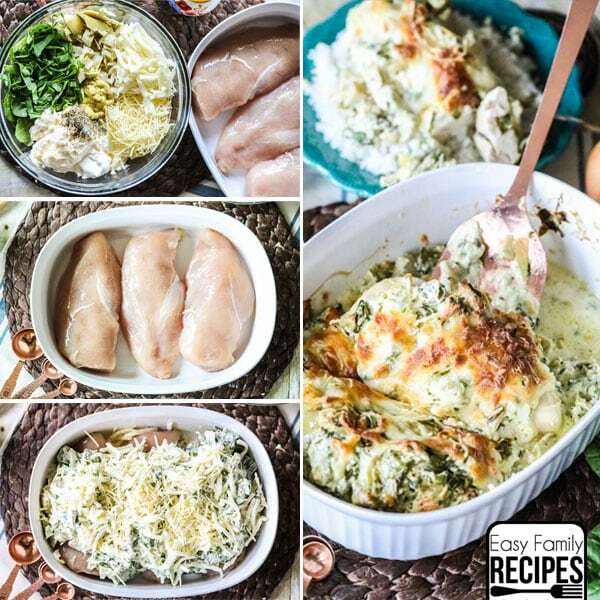 This Spinach and Artichoke Chicken recipe is naturally very low carb. If you are following a diet where you want to keep it low carb then there are a few great serving options. Let me know in the comments if you have other ideas! Greens– Even though this already has spinach, it still goes really well on top of a bed of sautéed spinach or similar greens. I for one can never get enough garlic sautéed spinach! Cauliflower– Cauliflower is absolutely perfect for this recipe. There are two main ways that I usually make it. I either do a cauliflower rice (how to make cauliflower rice here) or roasted cauliflower. You could also try a cauliflower mash! Salad– Since the Spinach and Artichoke chicken shines so much on it’s own you don’t really have to serve it over anything. You can just make a nice side salad and call it done! 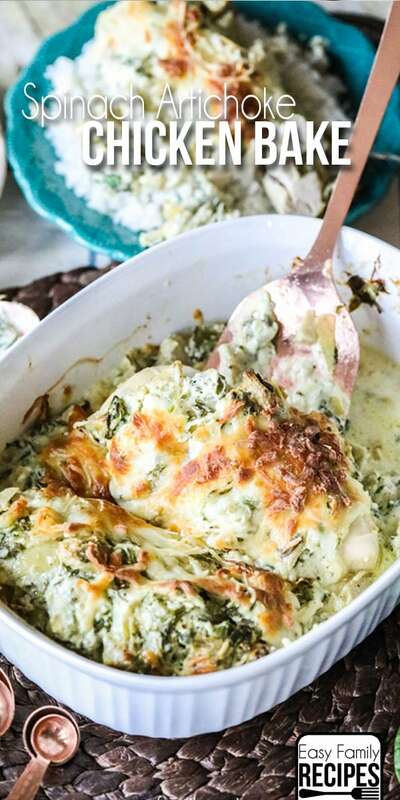 This recipe combines some of my favorites- easy baked chicken and creamy spinach artichoke dip. I will share all of my notes, tips and tricks for the recipe below. If you just want the quick version, skip down to the bottom and grab the recipe card. This may look like a lot of ingredients, or at least more than my average recipe, but many of them are super easy simple thing like salt and pepper or a squirt of mustard. So don’t be intimidated. I promise, it will come together quick and be so, so delicious! 2 lbs boneless, skinless chicken breast- this is about 3-4 chicken breasts I try to get ones that aren’t too thick so they don’t take so long to cook. 1/2 Cup Sour Cream- you can sub light here if you prefer, but fat free will not work well. 8 oz Mozzarella Cheese, grated- If you want to cheat a little, you can use 12 oz of an italian cheese blend in stead of the individual amounts of mozzarella and parmesan. 1/2 Can Artichoke Hearts, drained and diced- since they are drained, you can use artichokes that are in water or marinated and it won’t effect the final dish. 4 cups Fresh Spinach, (about 4 cups) coarsely chopped- You can use frozen, but I really recommend fresh. If you do use frozen it will be about a cup instead of 4 since it is already wilted, and make sure to get chopped so you don’t end up having a hard time eating long strands of spinach. Also, you will need to wring it out extra well or the end dish will be very watery. Preheat the oven to 375˚F. Lay the chicken breasts flat in a large baking dish and season with garlic powder, salt and pepper. Use a dish big enough where they can lay flat and aren’t crammed in. If they touch too much it will take longer to cook, and no one will want to wait when they smell this cooking!Mix the cheeses, then set aside 1/3 of it (about 1/2 cup) which will be used to top the dish in the next step. In a large bowl, mix the mayo, sour cream, mustard, onion, and the remainder of the cheeses. Then fold in the chopped spinach and diced artichoke hearts. I like to make sure everything is chopped really small. This makes it all easier to chew when you are eating it after everything is cooked. You can really do no wrong on this step. Just throw it all in and mix it up! Spread mixture on top of chicken then top with remaining cheese. Bake on middle rack of oven for 30-40 minutes or until the chicken is cooked through (internal temp of 165˚F). It is really hard for me to give you an exact cook time.Each oven, altitude and climate make the cook time a little different, but the biggest factor is how big and thick your chicken is. I tend to try to avoid the super big ones just because they take so long to cook. I also think you are able to enjoy more of the flavors of the dip with each bite when they are smaller. Serve hot with any of the suggestions above. If you serve it with something else yummy let me know in the comments. Enjoy! 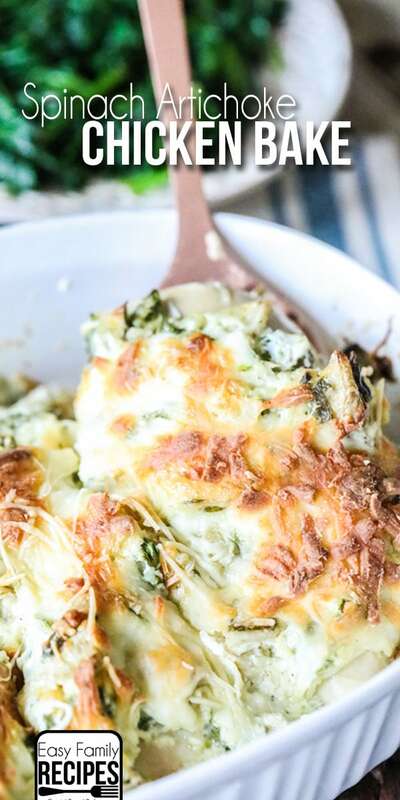 Spinach artichoke dip is one of my all time favorite foods and I have loved this dinner that makes it into an everyday meal. If you have a chance to try it out, I would love to hear from you in the comments. Or snap a pic and tag me on Instagram @easyfamilyrecipes. It makes my day to hear that you are trying and enjoying my recipes! For more easy recipes each week, don’t forget to sign up for my Hungry Email Club! 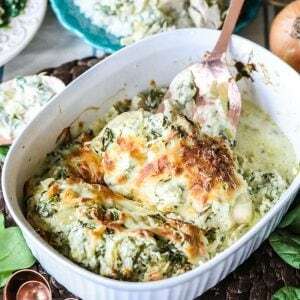 This creamy spinach and artichoke chicken is the ultimate comfort food, but still easy enough to whip up on a busy weeknight! Preheat the oven to 375˚F. Lay the chicken breasts flat in a large baking dish and season with garlic powder, 1/4 tsp salt and 1/4 tsp pepper. Mix the cheeses, then set aside 1/3 of it (about a cup.) In a large bowl, mix the mayo, sour cream, mustard, onion, remaining salt and pepper, and the remainder of the cheeses. Then fold in the chopped spinach and diced artichoke hearts. Spread mixture on top of chicken then top with cup of cheese that you set aside. Bake on middle rack of oven for 30-40 minutes or until the chicken is cooked through (internal temp of 165˚F). That is a good idea! I am usually just a simple get it done type so I layer but I absolutely think that would work and be delicious! I have a question, where do you put the leftover chicken juice from what you’ve just cooked before washing up the cooking dish? I get really funny about it just because it’s chicken. I know the chicken has been cooked but I still see it as a hazard before washing up my dish that I’ve just cooked it in. Any help would be appreciated! Could you substitute greek yogart for the sour cream? I haven’t tried that but my guess is that it would work really well. Please update us if you give it a try! could you pre make this and freeze? Loved this dish. So delicious….only issue was that it was extremely watery and I have no idea what happened. There will be some liquid released by the chicken and veggies. Some chicken breast has added fluid (to make it look plump and juicy in the store) which will cook out and make it more watery. Other than trying another brand of chicken, try baking in a larger dish to give the liquid more surface area to evaporate. I sprinkled some bacon on top leftover from this morning’s breakfast!! Can’t go wrong with bacon! I made it tonight. Timing and instructions are accurate and easy to follow. VERY flavorful and delicious. Thank you for this recipe! So glad to hear that you enjoyed it! I hope you get a chance to try more of our chicken recipes!